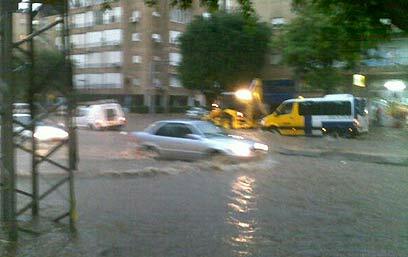 ﻿ EARLY MORNING MANNA » FLASHFLOODS IN ISRAEL…ANY SIGNIFICANCE? Boqer Or (Good Morning Light)! Wow! 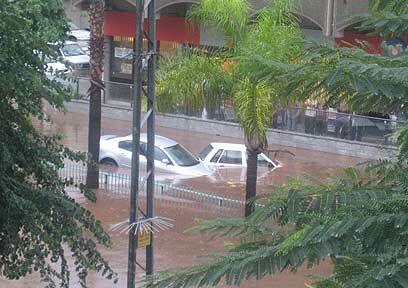 Massive downpours and flooding hit the central sector of Israel last week and more is on the way! Is there any significance to the recent Flashfloods here in Israel for us who are looking to this promised land as a prophetic clock in understanding world events? I believe there is and the immensity of the display of the atmospheric disturbances here has been quite startling! What a lighting show indeed! Early Friday morning, after waiting in His shahar blackness of the predawn glory haze, I attended my weekly long distance run here in Israel with some friends. Soon this run in the sand dunes along the beach was swallowed up in a unprecedented display of lightning and thunder that even startled some of the IDF reservists running with us. As the rains fell I noticed how sweet it tasted compared to the rains I experienced in the recent 100 year flood that deluged Atlanta last month. The Scripture verses that kept coming to me during this run was that this is the “showers of blessings” spoken of when the true shepherds arise before the Gog/Magog war of Ezekiel (see Ezek. 34:23-31)! Wow! I’m telling you dear warriors, I have been in a plethora of violent thunderstorms being raised in the USA, yet I have never experienced such a lightning storm that just continued day after day this last week! What does all this mean for us?